New Delhi / Mumbai: Domestic oil firms have reduced jet fuel prices for the second consecutive month, but executives at India’s leading airlines said customers will not benefit in terms of cheaper fares, given the huge losses carriers have piled up in the last one year or so when global fuel prices surged. After touching a record Rs71,028.26 a kilolitre in Delhi in August, state-run oil marketers that control aviation turbine fuel (ATF) prices for almost all of India’s airlines reduced prices for September by nearly one-fifth to Rs59,650.07. For October, airlines will be able to buy fuel in Delhi cheaper by another 5.36% at Rs56,447.80 a kilolitre, according to ATF price information posted on Indian Oil Corp. Ltd’s (IOC) website. In Mumbai, prices of ATF fell by 5.42% to Rs58,479.37 a kilolitre for October, compared with Rs61,834.81 in September. Still, airlines are unlikely to reduce airfares with the start of the peak festive season. Instead, passengers may end up paying 5% more on tickets as carriers stop paying 5% commission to travel agents on the tickets booked by them from November. SpiceJet does not intend to reduce fares unless ATF prices come down by another 10% to pre-April levels, or about Rs47,048.86 a kilolitre in Delhi. “Which is when we will start considering passing on fuel surcharge reduction (to passengers)," Sridharan said. Before the correction in current fuel prices, domestic airlines said they expected to post a loss of more than $2 billion (Rs9,380 crore) in this fiscal year to March 2009. 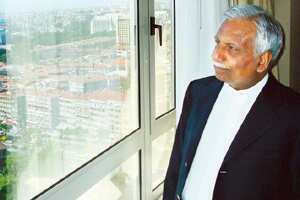 Jet Airways (India) Ltd’s chairman Naresh Goyal said on Monday that his airline group, which currently has the largest share of the domestic market, expects only an increase in fares. “There should be 30% increase in airfares and 30% reduction in capacity to makes airline industry profitable. The prevailing overcapacity in the Indian market has led to an unprecedented competitive environment. Airlines cannot be profitable if the fares charged do not cover expenditures of fuel and basic operating costs," he said, terming the last few years’ growth as not sustainable. A senior official at IOC, the country’s largest jet fuel supplier, was critical of airlines, saying that they seek reductions in aviation fuel prices, but do not pass it on to the consumer. “We reduced last month too, but airlines did not reduce even one paise," the executive said on condition of anonymity. When asked by how much airfares needed to be raised to cover losses, Kingfisher Airlines Ltd’s executive vice-president Hitesh Patel had said last fortnight, “It’s not even imaginable."